Alternative Trans. 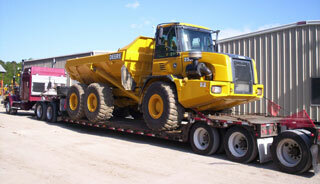 Service, specializes in the transport of all oversize and permit loads. Our professional staff is uniquely qualified to handle all of your questions regarding permits, escorts, route surveys and police escorts if needed. ATS has a wide variety of equipment available to us. This includes Removable Gooseneck (RGN), Double Drop, Lowboy and Stretch type trailers. Our large fleet of specialized equipment gives us an unparalleled advantage when it comes to working on large projects and oversized loads. We would like to thank you for considering our services and reassure you that all of your shipping requirement’s will be treated with the utmost of care and safety. Please give one of our transportation specialist a call and let us show you why we have become one of the best in the transportation industry today.